Protecting your home from flooding and water damage, your gutters need to be working properly. We provide eavestrough repair Toronto residents depend on to keep their homes protected. Whether its leaks caused by improper installation or failing joints, our gutter repair experts will solve your problem quickly and affordably. With over ten years experience providing services throughout the GTA, we’re Toronto’s top choice for eavestrough repair services. Our technicians are highly trained, friendly professionals with WSIB coverage and full liability insurance. Providing industry leading customer service, we’re here to help. Gutters fail in a variety of ways, it could be faulty or incorrect installation, or wear and tear from the elements resulting in rust, corrosion, or loose joints. A common problem that gutters and eaves experience is leaking from the seams. This is due to a failure of the compound that seals these seams. Seam repair is the process by which we mend gutters the joints between sections of gutter and thus prevent leaks. This work also includes gutter corner repair and gutter joint repair. Our team is experienced in effective repair, maintenance, and rehabilitation of gutters. Performing gutter leak repair is the best way to solve leaking and associated problems such as flooding and water damage. In event, this work aids prevention of problems due to subsequent problems associated with excessive moisture on the exterior of the property or in the foundation. Home maintenance is an on-going project. It’s important that damage mitigating systems, such as your gutters, are regularly inspected and when necessary have routine maintenance performance. Gutter maintenance is important; ignoring a small problem with your gutter system can lead to larger, and much more costly, problems down the road. Sagging gutter repair is one area we are experienced in repairing. Regular inspection and associated maintenance solves this problem in many properties. Having your gutters inspected bi-annually, early spring and early autumn, is a good idea to ensure it they working properly. The technicians from NICK’S Window Cleaning are experienced in providing eaves inspection and maintenance. Residential gutter repairs are quite a common occurrence across the Greater Toronto Area. Our winters are harsh and falling leaves during autumn place quite a burden on these systems. While eavestrough cleaning can mitigate these problems, damage does occur from temperature fluctuations. Commercial properties also require regular inspection, maintenance, and gutter repair. 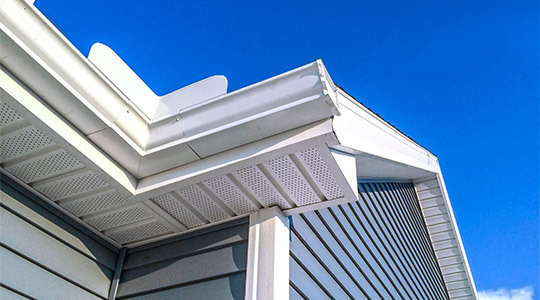 Our technicians are versed in commercial gutter repair in addition to house eaves repair services. We service the entire Greater Toronto Area, to discuss commercial service please contact us directly to discuss your specific needs. You can count on timely job completion and the best rates in the city with our service. Front start to completion, we value our customers highly and provide top-notch customer service and satisfaction. Our workers are safety conscious. They treat you and your property with respect, leaving behind no mess, just repaired eavestroughing. We believe in building long-lasting relationships with our customers. You can count on us to provide exceptional service quality. For a free no-obligation estimate, contact us and discover why more people are depending the the Toronto eavestrough repair services from NICK’S Window Cleaning. Hiring someone to handle your gutter and downspout repair services is one of the smartest moves you can make as a property owner. This work is not easy for the typical homeowner or property owner to manage on their own with limited experience and resources. Eavestrough repair and cleaning is our speciality. Our team is experienced in providing inspection, cleaning, and restoration services. From locating problems with downspout outlets, to mending failing spikes and damaged ferrules, we will solve your problems quickly and affordably. We take the worry and danger out of maintaining your eavestroughing system, allowing you to enjoy your property. For some, climbing ladders to inspect your gutter or downspout may not be a complex task. One must consider the potential danger that is present in these working conditions. Many well-intentioned, good people have been seriously injured trying to save a buck, or even just experiencing the thrill and pride of working their own property. 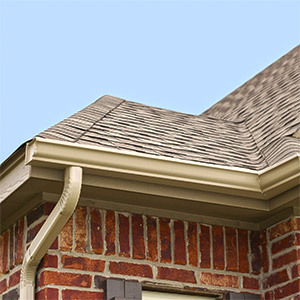 As a professional gutter and downspout repair service provider, our team is skilled and competent in the entire process. Possessing the necessary tools and equipment to carry out the work. We have the right ladders and associated attachments to perform all eavestrough repairs without damaging your property. All of our workers feature WSIB coverage and our company has full liability insurance. Offering the best rates and practices in the industry our team provides high-quality fixes for problematic downspout and gutters.